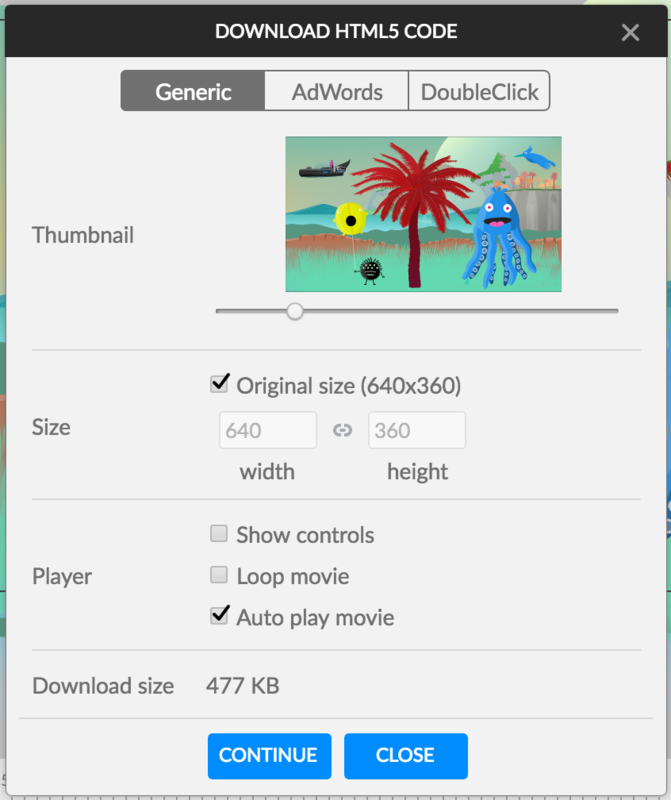 You can easily download your project in several media formats by clicking on the Download button located at the top-right of the Editor in the Project Header. 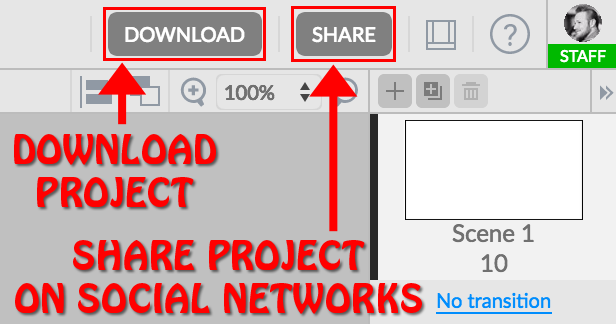 You can also quickly Share your project directly to your linked social networks of choice, by simply clicking on the Share button, next to the Download button. Choose your desired settings, then just click the “Continue” button and download the resulting HTML5 zip file. 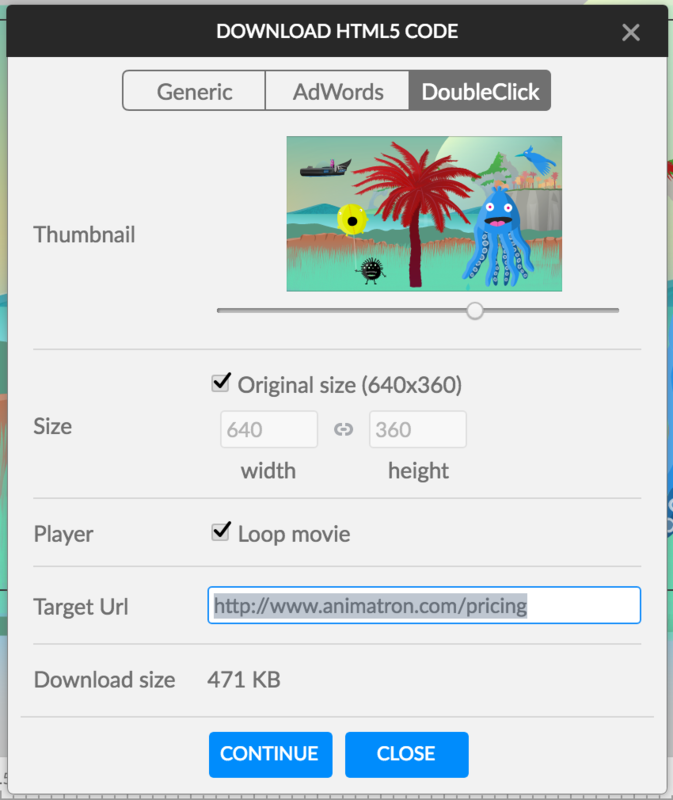 To quickly download a single snapshot image of your canvas (at its current point in time on the Timeline), choose the Download PNG option. 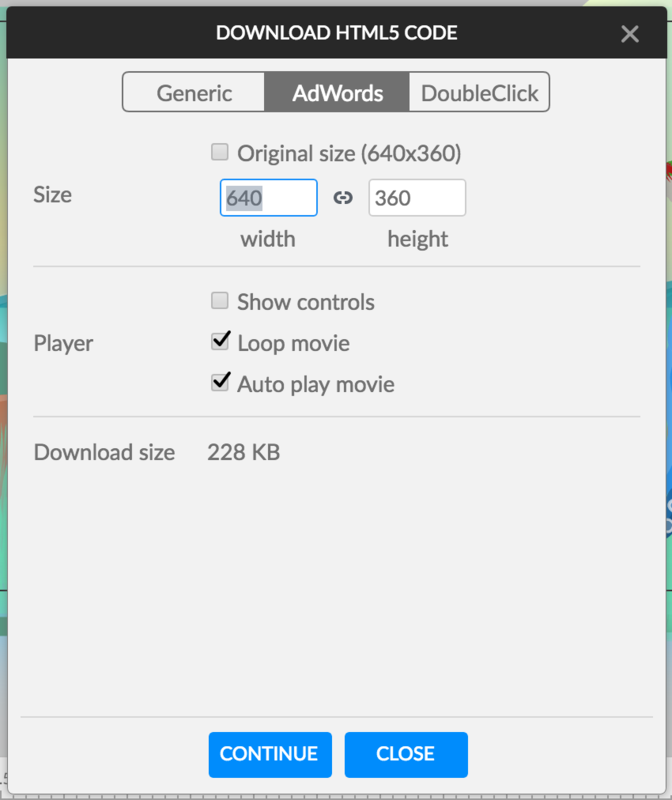 Shortcut: Press [command + M] (Mac) or [ctrl + M] (PC) on your keyboard to quickly download PNG snapshots of your canvas. To quickly download a static SVG snapshot image of your canvas (at its current point in time on the Timeline), choose the Download SVG option. Shortcut: Press [command + K] (Mac) or [ctrl + K] (PC) on your keyboard to quickly download SVG snapshots of your canvas. To download your project as an SVG SMIL Animation, choose the Download SVG SMIL Animation option. Choosing the Download Video... format, your project will download as an .mp4 video file. You then have the option to select the video output resolution in either SD(Standard Definition) or HD(High Definition) quality. Choose your desired settings, then click the “Continue” button. Note: A PRO Subscription is required to download HD quality video. Depending on the length of your video, the loading bar will take a while to fully process the video rendering. However, you can always click on the "Close and have link by email" button so you can go right back to working while your video renders. Don't forget to check your email for your finished video! 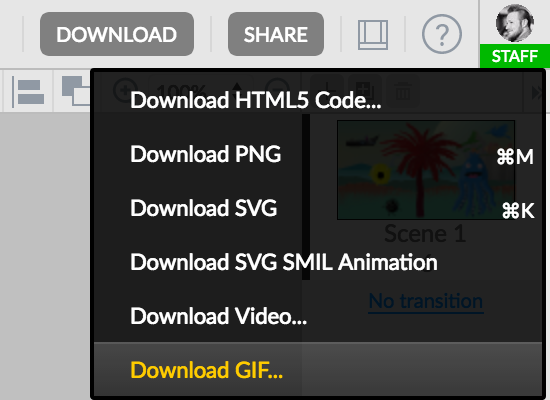 Choosing the Download GIF... format, you can select options to resize video dimensions, loop the project or change the FPS (Frames Per Second) at which you want your video to play. Choose your desired options, then click the “Continue” button. Note: You cannot exceed 24 FPS with the GIF format.